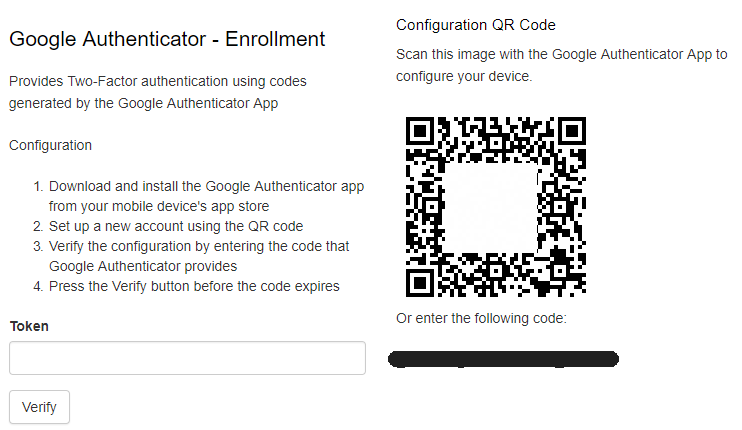 Users can be enrolled into the Two Factor Authentication by their Administrator, and can use an Authenticator app to enter 6-digit codes. Users can be enrolled in bulk or allowed to Self-Enroll. Admins can choose to allow user's to Self-Enroll and even to generate their own secrets, or they can enroll a user individually. This QR code or the configuration code must then be distributed (eg. by email or another other means) to the user.